A bicycle multi-tool is an exceptionally useful thing to have and can get you out of a number of tight spots. It might not be sufficient for all your repair needs, but it’ll let you make repairs and adjustments roadside. On the whole, you’ll want to check what sort of fittings and screws there are on your bike to make sure that the multi-tool will fit. There’s a couple of ways to go when purchasing your multi-tool. 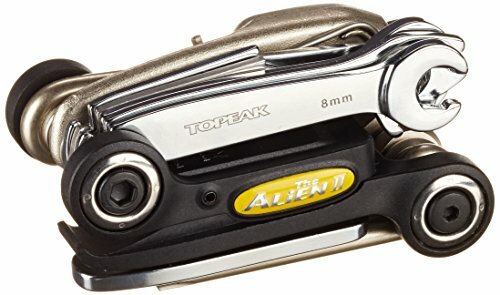 First, choosing the smallest and lightest tool that only has exactly what you need but isn’t too bulky to slide into the back of your cycling top. The other option is to pick something that crams in as many fittings as possible. This way, you can be prepared for anything and maybe even help other riders on the road. In this article, we’ve taken a look at some of the best multi-tools for your bike. We’ve described what’s good about them and picked out their best features so that you can make an informed decision when you’re purchasing bike accessories. 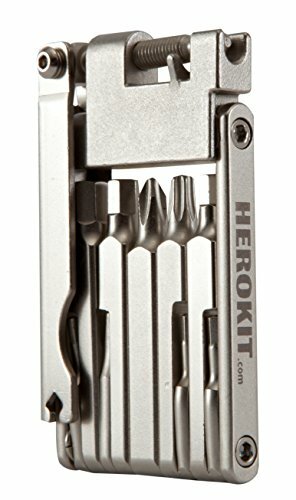 This is a neat light multi-tool which packs a punch. 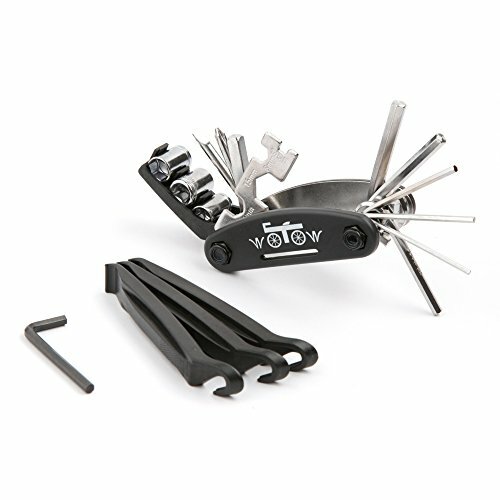 It has 19 separate tool fittings in a neat, fold-out design which weighs an impressive 6.1oz. It’s made from high tensile steels and features texturized edges for a secure handhold even in cycling gloves and when the weather is bad. It has just about every fitting you might need. There are two Phillips and two flathead screwdriver fittings. It has seven sizes of a hex wrench, four sizes of spoke wrench and two sizes of an open wrench. In addition, if you’ve got a more modern bike with Torx fittings, then it comes with two sizes of a wrench for that. Finally, it has a universal chain tool so you won’t end up stranded by the road. There’s also a neat little stainless steel flask which it fits inside. 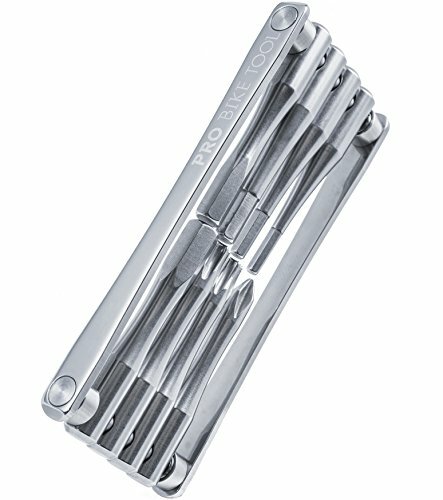 Why We Like It – This is a multi-tool which has almost every fitting you could need without being too heavy. It has a sleek design and will allow you to fix almost any bike at the side of the road. Put it in your backpack and off you go! This set includes much more than a multi-tool. It is an excellent value kit that, if stored in your pannier or rucksack, should mean that you can complete almost any basic repair. The whole set comes in a durable, anti-abrasive nylon pouch. Inside you’ll find a mini-bike pump, a pair of tire levels, a puncture repair kit, a multi-sized hex-wrench, and, finally, a multi-tool. The bike pump is small and lightweight but can achieve pressures of up to 100 PSI. 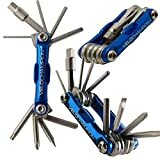 The multi-tool itself is 16 in 1 and contains a variety of different wrenches and two screwdrivers. Why We Like It – This kit will give you plenty of versatility and allow you to mend any punctures that you might end up getting. It will have wrenches and screwdrivers that’ll fit more traditional model bikes. 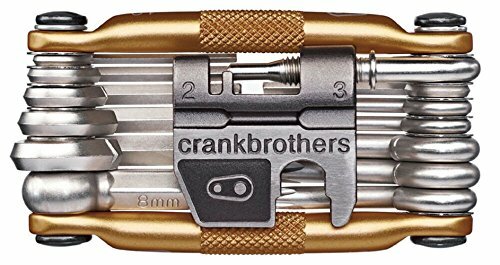 This is a neat little multi-tool that offers almost unbeatable value for money. It offers solutions to most standard fittings. It is a 16 in 1 tool and contains six different sizes of Allen key, three different sizes of socket hex wrenches. 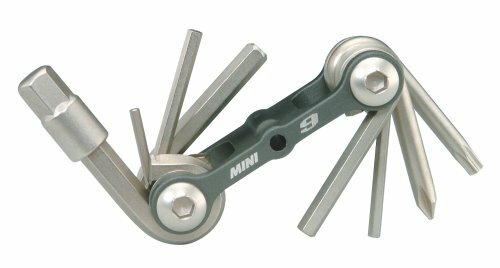 Very usefully, it has a spoke wrench which will help you out if you ding a wheel and end up needing to re-true your wheel. Make sure it’ll fit your spokes though, especially if you have a non-standard size. They even throw in three nylon tire levers. Why We Like It – This is a slender, fairly lightweight multi-tool that’ll help you complete most basic repairs on your bike. It is extremely good value too. This is a small and stylish multi-tool. It is a 10 in 1 tool which means it has slightly fewer fittings than some of the other tools we’ve reviewed. Fewer tools, however, means it is smaller and more lightweight: it’ll take up less room in your seat bag, and it’ll still probably have most of the tools you need for roadside repairs. It has Allen keys in 7 sizes, flat and a Phillips screwdrivers, and a T25 Torx wrench. The Torx wrench is a great extra feature and means it’ll fit a lot of the more modern and technical bikes. It doesn’t feature any socket wrenches, but what you lose in a bit of functionality, you gain in its small size and weight: just 2.4 ounces! Why We Like It – If you’re a racer and space and weight are at a premium, then this multi-tool is a great option. It’ll give you nearly every tool you might need without taking up much space at all. This is a similar idea to the VeloChampion. The Mini by Topeak is just that: mini. It’s a 9-function bike tool with an elegant fold-out design. It is made using high-quality materials and components and has been tested by the manufacturers to ensure a high level of durability. The body is made from extruded aluminum to save on weight while the tools are made from hardened steel for strength. It doesn’t have a flathead screwdriver but does have a Philips and a Torx screwdriver. The rest of the fittings are a variety of Allen keys. It has nearly every fitting that you need to make roadside repairs and adjustments. In addition, it comes with a neat neoprene bag. Why We Like It – Another great option if you’re wanting something that doesn’t take up much room. It has a really stylish design that is efficient as well as good looking. Alien II is an extremely impressive bit of kit. It has a frankly astonishing number of tools and manages to squeeze almost an entire toolkit into a two-piece body. It has 31 different functions which will enable you to complete almost any repair, apart from a cracked frame. Of course, it has every size of Allen wrench you’ll need, two screwdrivers, a mini pedal wrench, three sizes of open wrench, a T25 Torx wrench, two spoke wrenches, a bottle opener, and even a serrated knife. Incorporated into the body are two tire levers. It weighs 10.21oz which, for what the multi-tool includes, isn’t bad at all. Why We Like It – This multi-tool is a little bulky but behind the bulk is an amazing range of tools. It’ll let you complete almost any kind of repair on almost any type of bike. This is a slightly different offering from Pro Bike. It is a ratchet with a variety of 10 different head fittings. The big advantage of the ratchet design is that it’ll give you superior leverage to the other products we’ve reviewed. This means you can even use it at home for long-term repairs. 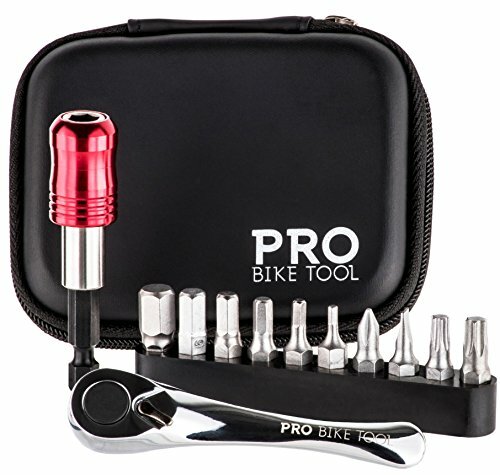 If you’ve got extremely tight fittings, this bike multi-tool has a good chance of getting them off. It has a variety of Allen fittings, T25, and T30 fittings, as well as flathead and Phillips fittings. 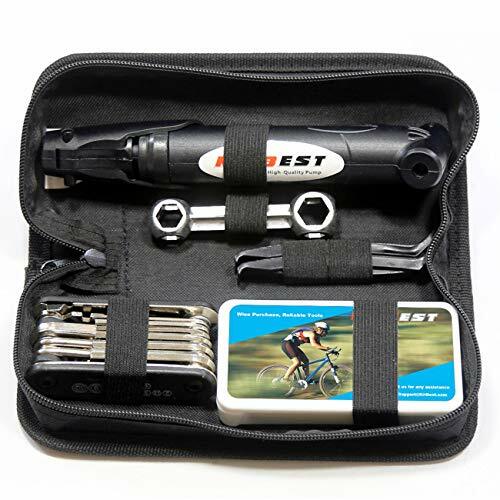 It all comes in a handy hard case pouch which will keep it neat on rides. Why We Like It – If you’ve tried a multi-tool and you found it difficult to get purchase on your fittings, then this might be a really good option for you. It offers the strength and leverage of a much larger toolset. Another slender and lightweight bike multi-tool which just features the essentials. 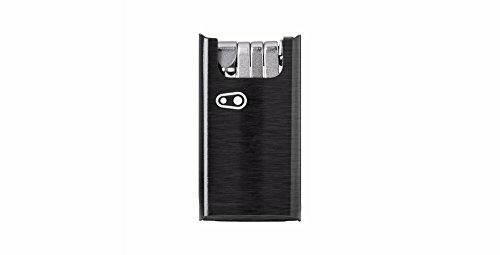 It has a great looking, cold forged stainless steel design. As well as looking good this offers strength and durability. Because it is so slender, it can easily fit inside a seat bag or in your cycling top. It offers a nice mix of portability and design. It is only 0.3 inches thick and weighs 3.49oz. It features T25 and T30 wrench fittings, so is well suited for more modern and higher end bikes. It has five sizes of Allen key and a Phillips head screwdriver. It offers 90° and 270° auto-indexing which makes for easier usage. Why We Like It – It’s a stylish and slender multi-tool. It has the fewest number of fittings of the products we’ve reviewed, but if that’s what’s on your bike, it’s all you need. Why waste space? This multi-tool has an impressively narrow design for what it manages to fit into its kit. It is only 2.8 inches long and 1.7inches wide. At 5oz it is lightweight for all the features it offers. It is something of a hybrid between those tools that try to be as small as possible and those that try to cram as much in as possible: this bike multi-tool tries to do both and doesn’t do a half bad job at it! It features a great array of tools including a Torx bit, and 2 spoke wrenches. There’s also a durable chain tool too, which is incredibly useful for the nightmare that is a damaged chain. It’s made from durable stainless steel which won’t corrode even under wet conditions. Why We Like It – The added functionality of the bike tool is a huge plus on this tool. It manages to achieve this function while also having a flat and lightweight design. These are maybe the coolest bike multi-tools we’ve reviewed. You can choose from the F10, the F10+ or the F15. The F10 features all the essential Allen keys, a flat and Phillips screwdriver, and a T25 wrench. The F10+ adds a cool magnetic case which keeps your tools protected. The F15 adds four spoke wrenches and a chain tool. The F15 weighs 8oz. Why We Like It – This is a multi-tool that looks great. With the F10 you’re getting the bare essentials, but if you upgrade to the F15, you’re getting an impressive tool that’ll suit a range of needs. We’ve already talked about the line that most bike multi-tools tread between utility and portability. On the whole, you’ll find that your bike multi-tool will either be stripped down to its bare essentials and be as lightweight and slim as possible, or it’ll be crammed full of a bunch of features and essentially be an all-in-one toolkit. The important thing to work out before you make a purchase is which fittings you’re going to actually need. Of course, it’s different on every bike as different manufacturers will put different screws in different places. This being said, in the buyer’s guide, we’ve taken you through the tools you’ll find inside the multi-tools, and we’ve explained where you’ll use them and how useful they might be. An Allen key is an essential tool for any bike. Sometimes they’re called hex keys or hex wrenches, but whatever you end up calling them, they’re the most useful tool you can have. You’ll find hex bolts all over your bike in a variety of sizes. They’re a versatile, straightforward bolt, so you’ll find them in a lot of simple places. This means that you’ll probably need an Allen key to readjust the height of your saddle or your handlebars. This is why you’re going to find them in a variety of sizes on every multi-tool. Six-sided bolts tend to be found on older bikes. 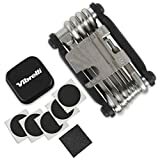 You might find them on V- or caliper brakes, and so if you need to adjust your brakes on an older model, you might want to choose a multi-tool that has some socket wrenches. Or, sometimes they’ll be used on a seat post clamp. They’re starting to be used less and less on bikes so it is worth just going over and checking your bike to see if you can see any in any important places. If you’ve purchased your bike more recently, there’s a chance that you won’t need a socket wrench at all. Torx is an increasingly popular fitting on bikes because they’re more difficult to round out than Allen fittings. Because they’re hard to round they’re used in places where you might need to exert a lot of pressure. It’s definitely worth bearing this in mind when you’re purchasing a bike multi-tool, because, depending on the design, it can sometimes be quite difficult to get enough leverage. You’ll probably find Torx fittings if you’re adjusting your cogset in a more modern bike. T25 is the most common size and the most commonly found in multi-tools, but T30 is also used, so make sure you know what’s on your bike. These screw fittings are found all over the world. On bikes, you’ll probably see Phillips fittings where you adjust your gears and your brakes, especially on slightly older models. Having them in your bike multi-tool will make it a more versatile device, for sure. Although damaging a wheel to the point of needing a spoke wrench is fairly rare, when it happens, it could make it impossible to ride your bike without adjustment. If you’re on a long bike ride, you could irreparably damage your wheel if you continue to ride it when it isn’t true, then you’ll be spending a lot more money to buy that new wheel. There are different sizes of spoke wrench for different sizes of spoke: make sure you check before you buy. More high-end bikes tend to use more rare sizes of the spoke. Similar to spokes, if you break your chain halfway through a ride, you’ll be unlucky. However, you’ll also need a chain tool in order to split the chain and put on a bridge piece. It is worth having a chain tool if you’re planning on going out on a long ride in tough conditions. It’s not an inconsiderable bit of repair work, and you’ll need to carry a spare chain piece so don’t buy one unless you’re confident using it. Tires levers are all but essential for removing your tires. This is needed for the simplest of jobs: a puncture repair. They are, therefore, one of the most useful tools around. Plastic ones don’t damage your wheels and are lightweight. If you don’t buy a bike multi-tool that features them, make sure to buy a pair separately. When you’re considering what bike multi-tool to purchase, think about what level of repair you’re comfortable doing. If you’re handy with a spanner and you know how to repair a chain, then maybe purchase something with all the features. If you’re just looking to make adjustments, there’s no point carrying around all that extra weight. Similarly, if you just go on short rides in close reach of repair facilities, there might be no need for something complicated. If you’re touring, you might need those extra features.